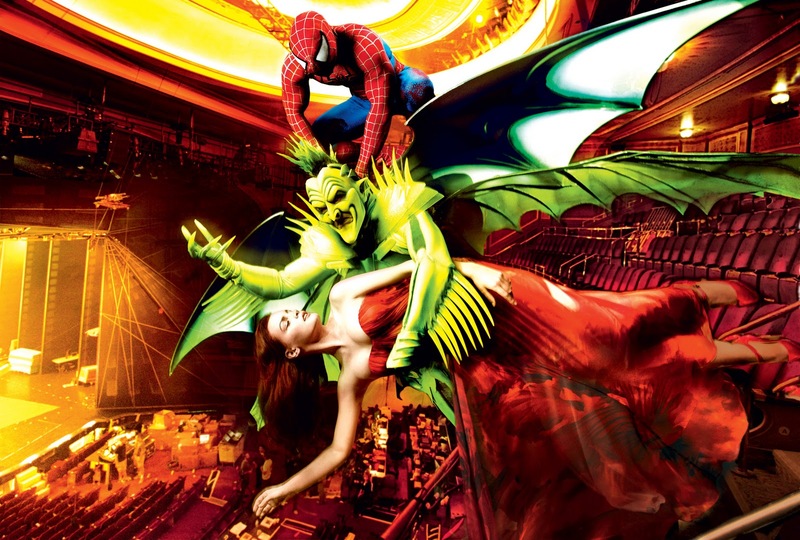 The Sound A Doggy Makes: On "Spider-Man: Turn Off The Dark"
I haven't seen many Broadway shows in my time, though I'm aware of the classics and a few amusements here and there. We studied Phantom in elementary school and the main plot and themes stuck with me. I think we even got to see a matinee of that on a field trip. There were a few dinner shows scattered about, a couple evenings at Jekyll & Hyde's in The City, then I think a class trip which included seeing a dress rehearsal for Beauty and the Beast. In college I got invited to see Wicked, mostly because the girl's grandma couldn't make it and the guy didn't want the day to turn into a date which would have certainly been rather awkward. Oh, and last Summer I got to see American Idiot which was amazing in a wonderfully not-classical-Broadway sense. Well, I've been following the Spider-Man musical, mostly with the curiosity born from sheer revulsion. I've never been a U2 fan and, honestly, I really really like that making fun of Bono is a standard of cheep comedy. I also hate the idea of "Them" screwing up a decent superhero character in the public eye yet again, but that's like saying, "I hate the idea of getting wet when it rains." You just learn to accept certain things. But as much as I dislike the idea, I was told a way to look at this debacle that I have to admit has my interest piqued. Would you, fanboy, like to see Spider-Man fight the Green Goblin directly over your head? Would it entice you further knowing that there is a rather large possibility that the entire car wreck go up like a real NASCAR rally in a conflagration of shattered bones and cricking arms writhing out of the orchestra pit? Of course you do. See? Doesn't sound to bad anymore, does it?